Private payrolls increased by 250,000 in October, which was above economists’ estimate. 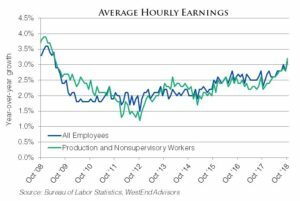 Revisions to September and August payroll gains were collectively unchanged as a downward revision to September was offset by a positive revision to August. Over the past 3 months, payroll gains have averaged 218,000 monthly additions, above the average of 188,000 since the beginning of 2010. Average hourly earnings growth was in line with expectations in October, growing 0.2% month-over-month. On a year-over-year basis, average hourly earnings for all employees rose 3.1% in October, up from 2.8% growth in September and the highest reading of the expansion (see chart below). Average hourly earnings rose 3.3% on a six-month annualized basis. As the demand for labor has become more competitive, year-over-year growth in hourly wages has gradually moved higher from its cycle low of 1.5% in October 2012. The unemployment was unchanged at 3.7% in October and has fallen -0.4 ppt over the past year. The U-6 rate, or a measure the of underemployed, which includes part-time workers and those only marginally attached to the labor force, declined -0.1 ppt in October to 7.4% and was at the lowest level since 2001. October payroll gains were broad based, with payrolls rising by at least 30,000 in professional and business services (+35,000), education and health services (+44,000), leisure and hospitality (+42,000), trade, transportation, and utilities (+37,000), and construction (+30,000). Payrolls rose across all industries. In October, the labor force participation rate rose 0.2 ppt to 62.9% from 62.7% in September. The participation rate has ranged between 62.7% and 63.0% for 29 consecutive months. Meanwhile, the participation rate for people aged 25-54 (prime age workers) rose 0.5 ppt to 82.3%, the highest level since 2010, and has risen 0.7 ppt over the past year. This report should not be relied upon as investment advice or recommendation and is not intended to predict the performance of any investment. These opinions may change at any time without prior notice. All investments carry a certain degree of risk including the possible loss of principal, and an investment should be made with an understanding of the risks involved with owning a particular security or asset class. The information has been gathered from sources believed to be reliable, however data is not guaranteed.